Broadleaf was engaged to lead the cost and schedule risk analysis of a very large underground mining project. As well as being relevant to an understanding of milestone dates, the schedule analysis had implications for the cost risk analysis through the impact of project duration on indirect costs. The schedule model was built in Primavera Risk Analysis (PRA) and the cost model was built in @RISK for Excel. Following common practice for this client, schedule outputs were exported from PRA to use in the cost model as drivers of duration-dependent costs. As other parts of the mine were developed to intersect with the tunnel, the rate of advance was planned to rise significantly, in major steps, as access and ventilation were improved and the rate at which spoil could be removed was increased. This is illustrated in Figure 1, where R represents a rate, L a developed length of the tunnel and T the elapsed time. The relationships between the variables are straightforward. The modelling challenge arises from the fact that, while T1 and T2 can be derived from other parts of the schedule, T3 depends not only on progress up to T2, which can be calculated from T1, T2, R1 and R2, with knowledge of the uncertainty affecting them, but also on the total length to be developed (L1+L2+L3) and R3, which are also uncertain. 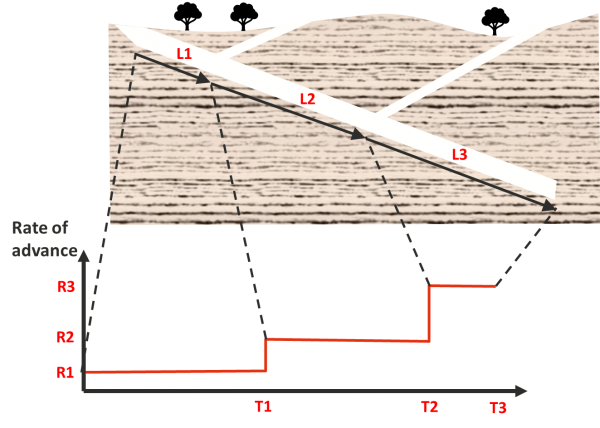 The overall length (L1 + L2 + L3) is known, subject to some overall uncertainty, but to calculate L3 we need to know L1 and L2. Schedule modelling tools can use the end dates of predecessors, such as T2, as the start date of a successor, but the tools currently available do not make available the information required to calculate the duration of stage 3. To do this, in addition to (L1 + L2 + L3) and R3, we need the simulated values of L1 and L2 in each iteration of a Monte Carlo simulation model. The calculation is simple, but PRA and similar tools do not provide a way to carry it out. They cannot carry forward properties of predecessors and use them to calculate a successor’s duration. The challenge we faced was to represent the uncertainty in tunnelling activity durations in the overall schedule risk model despite the limitations of schedule modelling tools. The approach we used to deal with this modelling challenge is describe in detail in our paper Schedule risk analysis of linear developments. We overcame this limitation by extracting from PRA the distributions for T1 and T2 and combining them in an @RISK model in Excel with distributions for R1, R2, R3 and the total length. In an Excel model it was a simple matter to simulate T3. The distribution for T3 was then exported back into PRA. A check was made to confirm that no correlation relationships were being violated by this approach. The model took proper account of the interactions between tunnelling rates, the timing of increases in these rates and the overall length of the underground development. This approach maintained a clear and transparent connection between the terms in which the project team understood and described the uncertainty affecting the tunnel development on the one hand and the model on the other. The team’s expressions of the uncertainty in rates and the total length of the development were used directly without being reinterpreted by the analyst. This maintained confidence in the analysis and the results it produced. Many modelling tools and methods are based on assumptions about the way a system, such as a schedule, will be described and the relationships between its component parts and parameters. When the tools do not fit a particular project, it is important to maintain a focus on the real-world situation, rather than being blinkered by the modelling mechanisms offered by a particular tool. With sufficient understanding of the principles of quantitative risk modelling, it is possible to develop a realistic model of something that does not fit a single tool by using an appropriate combination of tools and analyses.